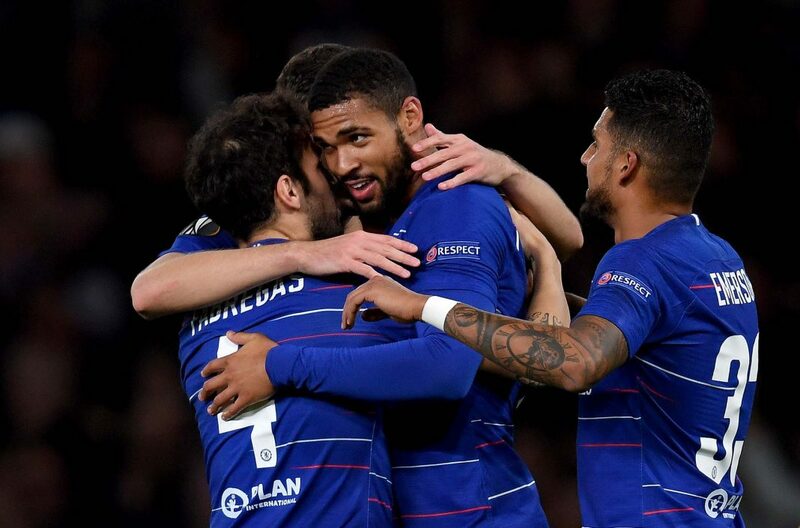 Ruben Loftus-Cheek of celebrates with team mates after scoring his hat-trick goal during the UEFA Europa League Group L match between Chelsea and FC BATE Borisov at Stamford Bridge on October 25, 2018 in London. Chelsea find themselves all but qualified for the knockout stages of the Europa League after a 3-1 win over BATE Borisov at Stamford Bridge. Three wins in three matches has Chelsea in total control in the group and will have a chance to clinch qualification with one win in their last three matches. Chelsea’s midfield is a crowded place at the moment, but Ruben Loftus-Cheek certainly didn’t hurt his chances of getting more opportunities by scoring a hat-trick on Thursday night, albeit against rather generous opposition. Against BATE, Loftus-Cheek was one of eight changes that Maurizio Sarri made from the team that drew against Manchester United on Saturday, and it was Loftus-Cheek that immediately made his mark on the match. Two minutes in, Davide Zappacosta, starting in place of Cesar Azpilicueta, beat his man on the right wing and drilled in a cross that Loftus-Cheek swept in from the penalty spot for Chelsea’s first and gave Chelsea fans a chance to breathe. Chelsea haven’t been the most clinical finishers in this competition, in particular from corners, but they broke the mould from both those tendencies six minutes later when Loftus-Cheek struck again from a Chelsea corner. Using all of his size and strength, Loftus-Cheek held off his marker and stretched out his leg to meet Willian’s corner ahead of Olivier Giroud to give Chelsea a 2-0 lead and ease a few supporters’ nerves. BATE seemed shell-shocked defensively and the question became how many Chelsea were going to score, especially when Andreas Christensen just missed prodding in his first goal for Chelsea after another Chelsea corner. Loftus-Cheek could have had his hat-trick in the first 40 minutes when Zappacosta volleyed a Cesc Fabregas’ pass back across goal, but Loftus-Cheek was caught in two minds and stooped to head the ball just wide. It didn’t take Loftus-Cheek long to get his third once the second half started. Pedro embarked on a slaloming run and lost the ball just inside the BATE penalty area. The ball fell for Loftus-Cheek who calmly side-footed the ball from 20 yards. Giroud could have added a fourth for Chelsea when Victor Moses lost control of the ball and it fell to the Frenchman just inside the area. Holding off his defender, Giroud turned to create enough space for a rising shot that Denis Scherbitski palmed away. BATE did get a consolation goal, but only after Chelsea had basically switched off. Zappacosta gave away a needless free kick just inside the right touchline, and from the resulting free kick, Alexei Rios evaded detection by the Chelsea defence to sneak in at the far post for a tap-in. An agitated Sarri sat down and began jotting down notes after the goal was conceded, and perhaps that will be a reminder to Chelsea that concentration levels must continue to be high even though the job is done.